I've been experimenting with a lot of media storage solutions lately, mostly because even though I have a great LaCie Terabyte hard drive, I have this fear in the back of my mind that the second I move it somewhere -- anywhere -- it will disintegrate or get damaged, and I'll have that horrible moment when I plug it in to face a blank screen. So, I decided I needed to sleep better at night about all this, and find some good solutions. 1. 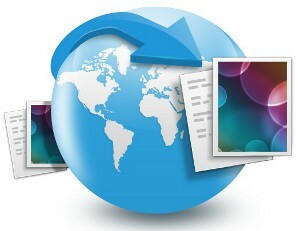 Googledocs: Many people think googledocs is only for documents, but you can upload photos quickly and easily. I pay $5 a year for extra storage space, and have 20GB available. Tip: make sure you create a new folder just for photos, so they don't get mixed up with your other documents. While there are no social media icons for sharing, you can easily download the images and email the links to anyone in your address book. 2. Picasa: Google also offers the option of a photo gallery through Picasa. It is easy to upload multiple photos at once, and you can make your photo albums public or private, as well as share. 3. Box.net: This is fast becoming my favorite program both for document and photo storage. You can easily create albums and view photos either in a gallery style view, or as a list. A unique feature of box.net is that you can not only share or email individual photos, but entire folders as well. The upload is a little slow if you have over 50 photos, but for reasonable upgrades you can get faster uploads as well as increased storage space. One drawback - no drag and drop feature for the Mac, as of yet. Darn it. 4. Dropbox: Here's your drag and drop. I love having the convenience of this application right on my desktop, and it's great for moving photos off my hard drive. I also use it for PDFs and ebooks I'm saving to read later. Users get 2GB free on the Basic Plan, 50 GB for $99 a year, and $100 GB for $200 a year. 5. Flickr: This was my very first "go to" photo storage site, and I still use it often for photo uploads, although I am nearing my max of 200 and have been warned that I will need to pay $25 a year to upload any more. Hmmm...One thing I love about Flickr is how easy you can create slideshows, although the last time I tried this, my caption text was masked by the formatting used for the screen menu. Still, it's a great tool for increasing online visibility, as you can easily grab a Flickr badge for your blog or website and be easily found. 6. Kodak: Kodak has an excellent photo gallery interface, and is free, but to keep your account active, you need to make one purchase a year. Kodak only allows users to upload jpegs, while Flickr accepts PEG, GIF, PNG, and TIFF formats. Kodak Gallery has its own software, Kodak EasyShareSoftware, an Internet Explorer plug-in and Gallery Mobile for uploading photos from your cell phone. 7. Photobucket: This program is easy to use, and seems to be most suited to uploading a small number of photos that relate to a specific event or occasion, as the program is heavy on templates for holidays and birthdays, etc. I didn't see a drag and drop feature, which made the upload a bit slow going. 8. SmugMug: Haven't tried this one yet, but you can catch a pretty detailed review over here. Looks good. 9. Webshots: I just found this site, and I'm impressed that on a free account, you can upload a generous amount of photos. The site is difficult to navigate for those challenged by Flash, but it boasts one of the largest photo libraries on the web. 10. Sugarsync: I read about this program recently and it has some unique features. While primarily a file synching application, it is easy to store and share folders. A "magic briefcase" stores the files, and users can choose whether to make them public or not. A free account comes with 5GB, and paid plans start at $5 a month, for 30 GB. What are your favorite programs? Post your comments here, and happy uploading!